According to Kotnis, Shri Sadguru Bhausaheb Maharaj was looked upon as the reincarnation of Sant Tukaram (1577–1650), a prominent Varkari Sant and spiritual poet of the Bhakti, who had taken birth again in the Neelwani Lingayat community to finish his work of spreading the knowledge of Self-realisation. Shri Sadguru Bhausaheb Maharaj belonged to the Deshastha Brahmin caste, the same caste to which the thirteenth century Varkari saint and philosopher Dnyaneshwar belonged, the 16th century sant Eknath, and the 17th century saint and spiritual poet Samarth Ramdas. 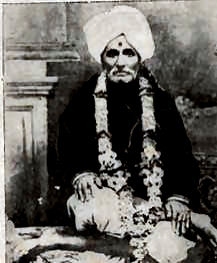 At the request of Nimbargi, Shri Sadguru Bhausaheb Maharaj Deshpande (1843 Umdi - 1914 Inchgiri) received mantra initiation from Shri Raghunathpriya Sadhu Maharaj, who was an ardent follower and a devoted disciple of Shri Sadguru Gurulingajangam Maharaj.Shri Sadguru Bhausaheb Maharaj became a disciple of Shri Sadguru Nimbargi Maharaj. Shri Sadguru Bhausaheb Maharaj teachings were collected in a book called Nama-Yoga, a term coined by the compilers and translators of the book, whereas Shri Sadguru Bhausaheb Maharaj himself called it Jnana Marga, just like Shri Sadguru Nimbargi Maharaj did. Shri Sadguru Bhausaheb Maharaj's teachings, and those of his student Gurudeo Ranade, have been called Pipilika Marg , "the Ant's way", the way of meditation, while the teachings of Shri Sadguru Siddharameshwar Maharaj and his disciples Shri Sadguru Nisargadatta Maharaj and Shri Sadguru Ranjit Maharaj have been called Vihangam Marg, "the Bird's Way", the direct path to Self discovery. After his awakening he was authorized by Nimbargi to carry on the lineage, and established the Inchegeri Sampraday.